Being a writer is a creative yet exhausting profession. You have to constantly find new perspectives, fresh ideas and different ways of saying something that in all probability has been said before. And once you have managed to write something, you need to be prepared to let the world see and criticize it. Before you send your dream novel, short story or poem out in the universe, you need to find a publisher who can stand with you through this journey of discovering your voice. The right publisher will shape your book in the correct way so that it manages to reach the audience it is intended to. They will also fight for your book, fight with you if need be and give it a makeover if that’s required. For writers in Washington State, there are multiple options when it comes to publishers. Small, big, traditional, modern and self are some of the types of publishers you can expect. We have compiled a list of 21 top book publishing companies in Washington for all the writers eager to start finding the right one. This Seattle based boutique publishing house has printed many award winning books over the years. An exclusive publishing house dealing with only literary fiction, some of its books have been nominated for prestigious awards like the American Book Award. Interested writers can only send their manuscripts via mail. Find guidelines and address details on this page. Tired of the lack of stories about and for people of color, NubiTales was started in 2014 to celebrate authors of color. The books they publish are not limited and include topics like fiction, non-fiction, children’s books and memoirs. Located in Seattle, NubiTales is made up of two Imprints- The Heritage Collection and Vantage Point Books. Submit a query letter for your submission, details of which can be found on this page. You can email your query to this address. Launched by Sam Hamill, Tree Swenson and associates in 1972, Copper Canyon Press is an exclusive publisher of poetry. Copper Canyon Press boasts of having published poetry’s icons like Rabindranath Tagore, Pablo Neruda and Octavio Paz. Translations, anthologies, re-issue of classics and contemporary poems are some of the genres they publish. They are a nonprofit publisher based in Port Townsend. They only accept submissions through Submittable during their open reading period which begins on 1st December 2017. Please read the guidelines carefully before submitting your manuscript for consideration. An independent boutique press in Seattle, Radial Books promotes unique narratives in contemporary fiction and poetry. Publishing only 2-4 books annually, Radial calls itself a ‘writer friendly’ press because of the creative control and terms it offers on a contractual basis. They accept submissions through Submittable for novels, poetry and short stories. First time writers should consider Radial because they prefer publishing multiple works by the same writer. Floating Bridge Press was established in 1994 to celebrate and encourage the poets of Washington State. This literary arts organization is supported by the efforts of the community and managed by volunteers. Floating Bridge Press holds readings, workshops and an annual poetry chapbook competition to find the next talented poet in Washington State. Their annual poetry chapbook competition began in 1995 and has flourished ever since. They also select authors for online publication and the same poems then are considered for the Paula Jones Gardiner Memorial Award. You can find submission guidelines here and send your entry via Submittable. An independent press primarily focusing on non-fiction, DIY and children’s books, Sasquatch Books is based in Seattle. They also have an imprint called Little Bigfoot which prints children’s books. Cookbooks, guides, nature, travel, gardening and design are some genres they have previously published. Read submission guidelines for Sasquatch and Little Bigfoot on this page before sending your manuscript. A press that goes back nearly 100 years, University of Washington Press first published a book in 1920. They have maintained impeccable standards through the decades by printing scholarly works in culture, history, environment, gender studies and general interest. They have published approximately 3500 books and continue to publish 70 titles annually. Follow the extensive instructions to submit your proposal for consideration. Operating as Peanut Butter Publishing or Classic Day Publishing, it is a premiere self-publishing company. Elliott Wolf launched Peanut Butter Publishing almost 45 years ago and they have managed to help 1500 authors with editing, proofreading, marketing, design and promotion. Having offices all over the country, their editorial office is located in Seattle. Memoirs, fiction, self-help and novels are certain genres they are interested in. The benefit of an experienced self-publisher is that they understand each project and writer will require personalized and tailor made services, which shall benefit the project. You can find contact details on this page and send a query. Jennifer Conner started Books to Go Now in 2010 with the intention to help and guide aspiring authors to hone their skills and get their novel published. They do not accept memoirs or non-fiction currently. Writers of short stories, novella, fiction, romance, mystery, chick lit, suspense and thriller can send their submissions via email to this address. Find submission guidelines and acceptable themes on this page. They offer a complete range of services right from proof reading to marketing which is a boon for first time writers as it can get your book to the correct audience. The publishing division of the Washington State University, WSU Press began its journey in the 1980’s. Since then they have published 200 titles in history, culture, academics, art and politics. They are not accepting fiction, novels or poetry currently. An eco-friendly press, they use recycled paper to print books. Interested writers can read submission guidelines and contact details on this page. A children’s book publisher in Seattle, Storytellers Ink uses interesting narrative techniques to teach children about values and morals. Meant for children aged 1-14, Storytellers Ink also works with Operation Outreach-USA, which provides education and literature material to children all across the country. Writers and illustrators can read submission guidelines and details on this page. Brad Fenison launched Pediment in 1997 after years of experience as a newspaper publisher. A new age publisher with the intent to collaborate creatively with authors, illustrators and artists to print books, make art and design apps, Pediment is based in Battle Ground, Washington. History, disaster, sports and food are genres they have dabbled in and they have printed 600 titles so far. You can send a query to them about your manuscript or idea by filling this form. Mountaineers Books was founded in 1960 by The Mountaineers, a non-profit outdoor organization to spread their interest in travel and nature. Photography, travel, adventure, nature, and trekking are some of the categories that have been previously printed by Mountaineers Books. They have 700 titles in print and do not publish fiction, children’s books and guides. Writers can find submission guidelines on this page. Started in 1988 in Fairbanks, Alaska, Epicenter Press is a publisher of non-fiction books. Their 175 titles include genres like fiction, comedy, thriller, action, memoirs and non-fiction. They are currently seeking submissions in fiction and non-fiction. You can read the submission guidelines and contact details of this Kenmore based publishing house here. Ed Marquand formed Lucia Marquand in the 1980’s in Seattle. A collaborative effort between creative minds, artists and museums, Lucia Marquand prints books that use visuals to convey art and culture. Design, editing services, production and printing are some services they offer. Lucia Marquand also provides co-publishing services for authors looking for art publishers. Authors and illustrators can contact this email address to learn more about their services. This Seattle based publisher is a leader in the comic book and graphic novel industry. It is the only independent contemporary publisher actively printing modern and innovative comics alongside Marvel and DC. Fantagraphics Books was started in 1976 and it has continued to use different themes like politics, drama and history in comics to emphasize it as a medium. They have maintained a crucial balance between visuals and words leading them to achieve commercial and critical success. Fantagraphics Books is not your average comic book publisher and are interested in finding authors, illustrators and writers with a fresh, challenging and unique perspective, impressive voice and edgy storytelling capabilities. Writers need to have a team with them if they can’t illustrate and vice versa. Authors and illustrators should read the submission guidelines carefully before writing to them since they are very exclusive. A Christian self-publishing company, Redemption Press was co-founded by Athena Dean Holtz in 2014. Situated in Enumclaw, Redemption Press believes in letting the writer take charge of the project and support him/her as needed. Amateur writers need not worry as Redemption Press has the full range of services required for publishing a book. Consulting, editing, proof reading, designing, branding, marketing and promotion are the services you can opt for depending on your need. The Submission guidelines are explained in this form and you can contact them using the details mentioned here. A specialty publisher printing modern books for adults and children with illustrations, Becker & Mayer is an imprint of the Quarto Group. They create content and photo rich books for their licensed partners, brands, companies and children. Activity, arts, science, craft, hobbies and history are some genres they can print books about. Submission guidelines and contact details are provided on this page. Initially started in 1976 as a print shop by Kurt and Norma Gorham, Gorham Printing shifted its focus to book printing later. Now a boutique self-publishing company, they have a free guidebook for writers interested in self-publishing. You can use their site to generate a quote depending on the services you require and your book dimensions. Design and publicity are their strengths so writers should consider using them for the same. Find contact details on this page for further queries. Formed in Edmonds in 1999, Ravenna Press is a small, unconventional publisher. On the lookout for poetry, stories and anthologies that differ from the typical and mundane, Ravenna Press has had titles reviewed by critics around the country. They are currently accepting submissions only in the Triple Series and the Pocket Series. You can send a sample and a biography to this email address before you consider submitting your manuscript. This Bothell based self-publishing company is a staunch advocate of the writer being in the driver’s seat of the publishing process. Sheryn Hara creates a plan suited to the writer’s book, idea and expectations. They have an extensive range of services that one might need like editing, proof reading, designing, marketing, promotion, e-book printing and distribution. Fiction or non-fiction authors can contact them and get a quote regarding the services. For every amateur writer waiting for the moment to share his story, you now have the names of the 21 top book publishing companies in Washington State right in your hands. Take advantage of the mixed bag of options available to you. Every genre has a publisher and you just need to follow the submission guidelines properly to embark on the journey that can take you from a writer to an author. Previously published authors looking to change their publisher can also find their next partner and have a better handle on the creative process in the future. Washington is going through an exciting phase in publishing and it is a perfect time to explore new narratives and stories with a publisher that can polish your story and correct the grammar but also market it to the audience. Do you run a publishing house in Washington? Please introduce your organization in the comments box below! 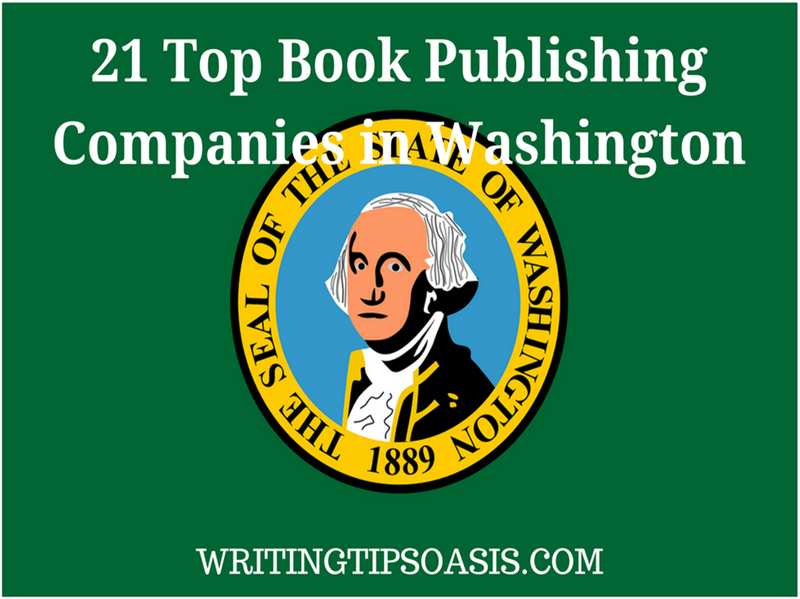 21 Top Book Publishing Companies in Washington is an article from Writing Tips Oasis.